Nevada is the 35th most populous state in the United States and is nicknamed Silver State due to the silver in the state and is historical importance. The bordering states are California, Idaho, Utah, Oregon, and Arizona. 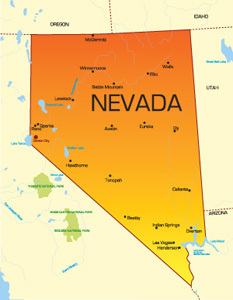 The capital city is Carson City but the largest city is Las Vegas, which has a population of nearly 600,000 residents. The major highways serving the city are I-215, I-515, I-80 and I-580. There are also airports such as the Reno-Tahoe International Airport. Notable attractions that drive tourism include casinos and hotels on the Las Vegas Strip like The Plaza Hotel and Casino. There are also large universities in Nevada such as The College of Southern Nevada.